Well, almost all: two of our research team members here at the Osteoporosis Program, Dr. Marta Erlandson, PhD and Dr. Maryam S. Hamidi, PhD, along with Jennifer Weldon from Osteoporosis Canada, were invited to give a talk on osteoporosis for the Monthly Patient Education Talk Series at the Toronto Western Hospital. Marta’s talk focused on exercise and osteoporosis and Maryam’s talk focused on the role of nutrition in preventing and managing osteoporosis. For the benefit of those were unable to attend, the talk was recorded and archived on the UHN Patient Education website. 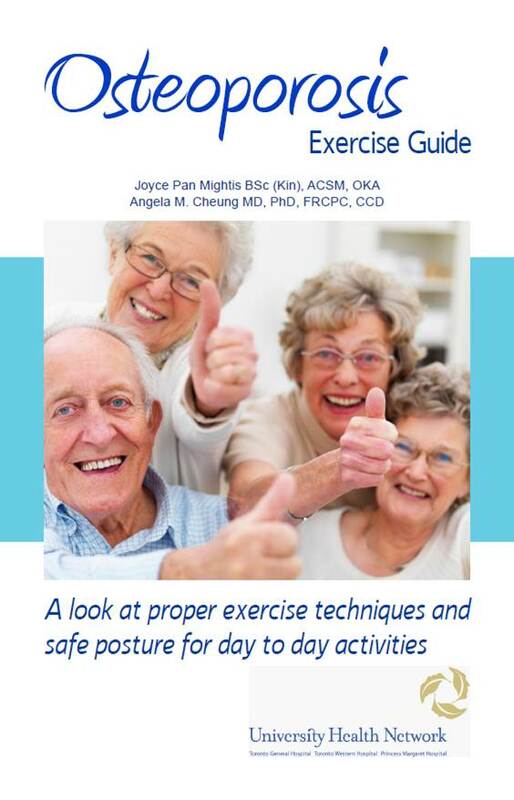 Please view it here to learn all you ever wanted to know about osteoporosis! Dr. Marta Erlandson obtained her PhD from the University of Saskatchewan. Her graduate research focused on getting to the bottom of the oft-debated question: does gymnastics training affect the growth and maturation of female trainees? (The answer is no, not really. You can read more about here research here.) Marta joined the Osteoporosis Program as a Post-doctoral fellow and is currently working on elaborating the bone and muscle relationship — how muscle changes with age and how these changes affect our bone health. In line with her expertise and her enthusiasm for the subject (she’s a former gymnast and pole vaulter! ), Marta spoke about the various ways in which exercise can both help prevent osteoporosis and increase bone mass in individuals who already have osteoporosis. Dr. Maryam S. Hamidi is our very own home-grown nutrition expert and can often be found giving nutrition advice to our colleagues or answering our curiosities on why coffee and chocolate may not actually be bad for you! (But that’s coffee with no sugar and 90% or above dark chocolate.) Maryam recently completed her PhD (June 2012) under the guidance of our Program Director and osteoporosis and women’s health expert, Dr. Angela M. Cheung. Her graduate research explored the relationships between diet and bone health. After obtaining her PhD, Maryam continued to work with the Osteoporosis Program as a Scientific Associate. She keeps busy doing even more research on diet and bone health and overseeing research studies in fracture patients. Not surprisingly, Maryam’s talk explored the role of vitamins, minerals, and other macronutrients and how they impact bone.